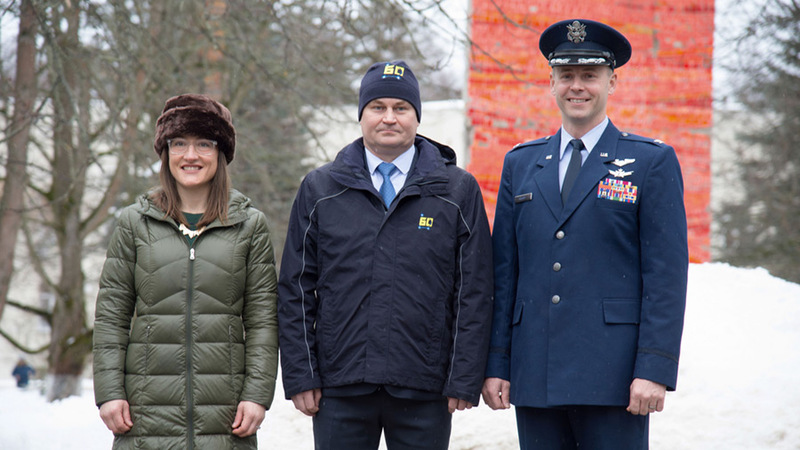 Expedition 59 crew members (from left) Christina Koch, Alexey Ovchinin and Nick Hague are pictured before departing for their launch site at the Baikonur Cosmodrome in Kazakhstan. The Expedition 59-60 crew arrived at the Baikonur Cosmodrome launch site in Kazakhstan today. Commander Alexey Ovchinin and Flight Engineers Nick Hague and Christina Koch are final training before their March 14 liftoff aboard the Soyuz MS-12 spacecraft. They will take a six-hour ride to their new orbital home where they will live and work until October. Meanwhile, the Expedition 58 crew is back at today aboard the International Space Station after taking the day off Monday. The orbital lab is also flying at higher altitude to get ready for the arrival Russian crew and cargo ships starting next month. The space station is orbiting two miles higher at its perigee after the docked Progress 71 resupply ship fired its engines for seven minutes and 31 seconds Monday night. This places the station at the correct altitude for the March 14 arrival of the Expedition 59-60 crew and the Progress 72 cargo craft docking on April 4. The station astronauts are training all week for the arrival of the first SpaceX Crew Dragon spaceship this weekend. The uncrewed SpaceX DM-1, or Demonstration Mission-1, will launch Saturday at 2:49 a.m. EST from Kennedy Space Center in Florida. The Crew Dragon will arrive at the station on Sunday and dock around 6 a.m. to the International Docking Adapter (IDA) on the Harmony module. Astronauts Anne McClain and David Saint-Jacques will monitor the Crew Dragon’s approach and rendezvous on Sunday. The vehicle is targeting a 6 a.m. EST docking to the IDA where the hatches will swing open about two-and-a-half hours later. It will undock on March 8 and return to Earth with a splashdown in the Atlantic Ocean ending its mission. 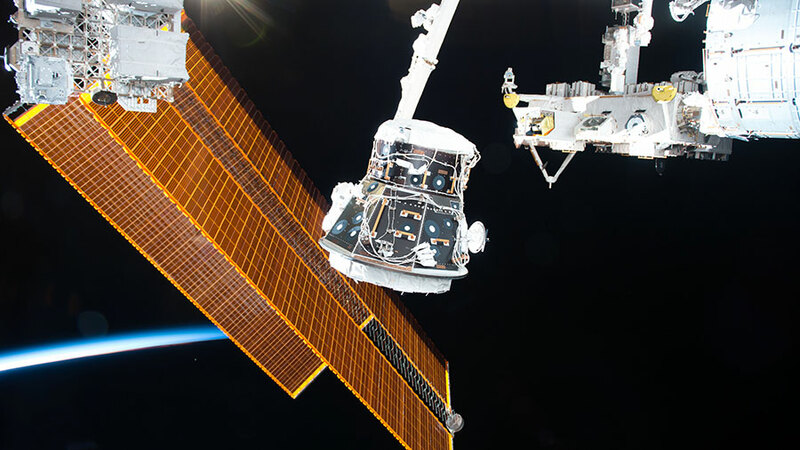 The SpaceX Dragon cargo craft is pictured attached to the International Space Station’s Harmony module framed on the left by the Canadarm2 robotic arm and a pair of the station’s main solar arrays. The SpaceX Dragon cargo craft is packed with science and hardware ready for return to Earth on Friday. NASA is also introducing a team of astronauts who will soon fly Boeing and SpaceX vehicles to the International Space Station. The Expedition 56 crew has finished loading Dragon with sensitive research results and station gear for analysis and refurbishment back on Earth. Space station officials from around the world gave the “go” on Thursday for Dragon’s release from the orbital complex. Mission controllers, with astronaut Serena Auñón-Chancellor monitoring, will command the Canadarm2 robotic arm to release Dragon at 12:37 p.m. EDT Friday. Splashdown in the Pacific Ocean will occur less than six hours later under a trio of huge parachutes off the coast of Baja California. NASA will introduce Friday at 11 a.m. on NASA TV new astronauts assigned to spaceflights launching from the United States for the first time since July 8, 2011. NASA’s Commercial Crew Program is partnering with Boeing and SpaceX to launch humans on U.S.-built spaceships from Kennedy Space Center on test flights to the space station. Expedition 56 Commander Drew Feustel and Flight Engineer Ricky Arnold of NASA completed the sixth spacewalk at the International Space Station this year at 2:55 p.m. EDT, lasting 6 hours, 49 minutes. 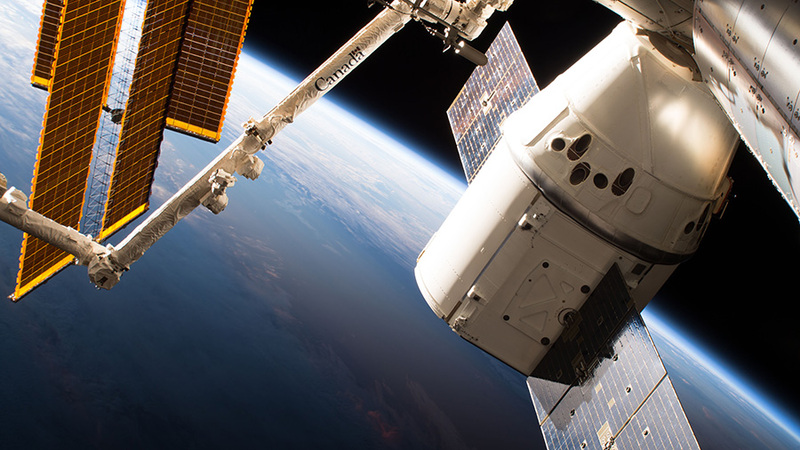 The two astronauts installed new high-definition cameras that will provide enhanced views during the final phase of approach and docking of the SpaceX Crew Dragon and Boeing Starliner commercial crew spacecraft that will soon begin launching from American soil. They also swapped a camera assembly on the starboard truss of the station, closed an aperture door on an external environmental imaging experiment outside the Japanese Kibo module, and completed two additional tasks to relocate a grapple bar to aid future spacewalkers and secured some gear associated with a spare cooling unit housed on the station’s truss. This was the 211th spacewalk in support of assembly and maintenance of the unique orbiting laboratory where humans have been living and working continuously for nearly 18 years. Spacewalkers have now spent a total of 54 days, 23 hours and 29 minutes working outside the station. During the ninth spacewalk of Feustel’s career, he moved into third place for total cumulative time spent spacewalking with a total of 61 hours and 48 minutes. It was Arnold’s fifth spacewalk with a total time of 32 hours and 4 minutes. For updates about the crew’s activities on the unique orbiting laboratory, visit: https://blogs.nasa.gov/spacestation/. Get breaking news, images and features from the station on Instagram at: @iss and on Twitter @Space_Station and @ISS_Research. NASA astronaut Drew Feustel seemingly hangs off the International Space Station while conducting a spacewalk with fellow NASA astronaut Ricky Arnold (out of frame) on March 29, 2018. Feustel, as are all spacewalkers, was safely tethered at all times to the space station during the six-hour, ten-minute spacewalk. 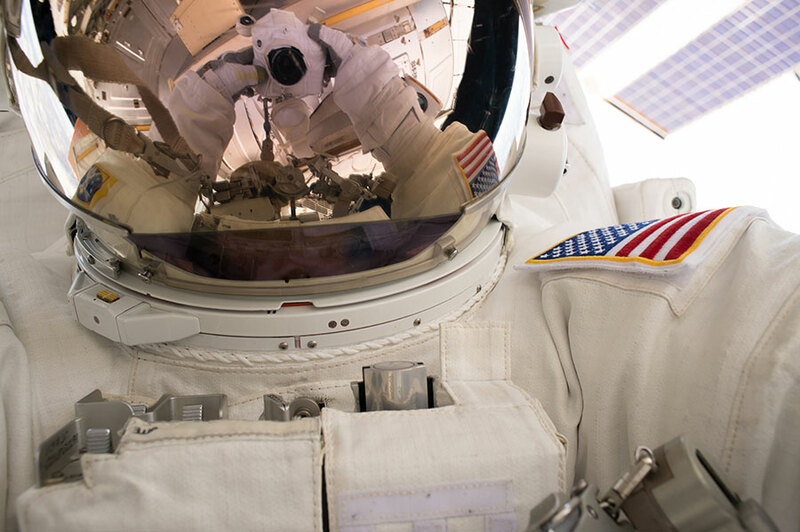 NASA Television and the agency’s website have begun the broadcast of today’s spacewalk. Expedition 56 Commander Drew Feustel and Flight Engineer Ricky Arnold of NASA are preparing to exit the International Space Station to make improvements and repairs to the orbiting laboratory. The spacewalk is scheduled to begin about 8:10 a.m. EDT and last about six-and-a-half hours. Newly arrived Expedition 56 crew members Serena Auñón-Chancellor of NASA and Alexander Gerst of ESA (European Space Agency) are supporting the spacewalkers. Feustel and Arnold will install new high-definition cameras near an international docking adapter mated to the front end of the station’s Harmony module. The additions will provide enhanced views during the final phase of approach and docking of the SpaceX Crew Dragon and Boeing Starliner commercial crew spacecraft that will soon begin launching from American soil. The astronauts also will swap out a camera assembly on the starboard truss of the station and close an aperture door on an external environmental imaging experiment outside the Japanese Kibo module. An Expedition 55 crew member inside the cupola photographed NASA astronaut Drew Feustel outside the International Space Station conducting a spacewalk with fellow NASA astronaut Ricky Arnold (out of frame) on March 29, 2018. 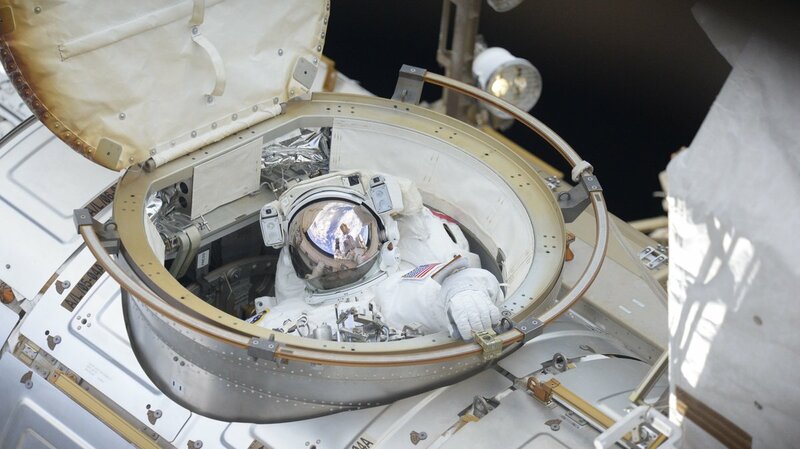 Veteran NASA astronauts Ricky Arnold and Drew Feustel will head outside the International Space Station just after 8 a.m. EDT Thursday to begin a planned six-and-a-half-hour spacewalk. Live coverage will be available on NASA Television and the agency’s website beginning at 6:30 a.m.
During Thursday’s spacewalk, Feustel and Arnold will install new cameras to provide high-definition views of spacecraft docking with the station. The two spacewalkers will install brackets and high-definition cameras near an international docking adapter mated to the front end of the station’s Harmony module. The additions will provide enhanced views during the final phase of approach and docking of the SpaceX Crew Dragon and Boeing Starliner commercial crew spacecraft that will soon begin launching from American soil. During their spacewalk, the astronauts also will swap out a camera assembly on the starboard truss of the station and close an aperture door on an external environmental imaging experiment outside the Japanese Kibo module. The imaging experiment hardware will be discarded on a future SpaceX cargo resupply mission. The spacewalk will be the 211th in support of space station assembly and maintenance and the sixth station spacewalk this year. It also will be the fifth spacewalk for Arnold and the ninth spacewalk in Feustel’s career. 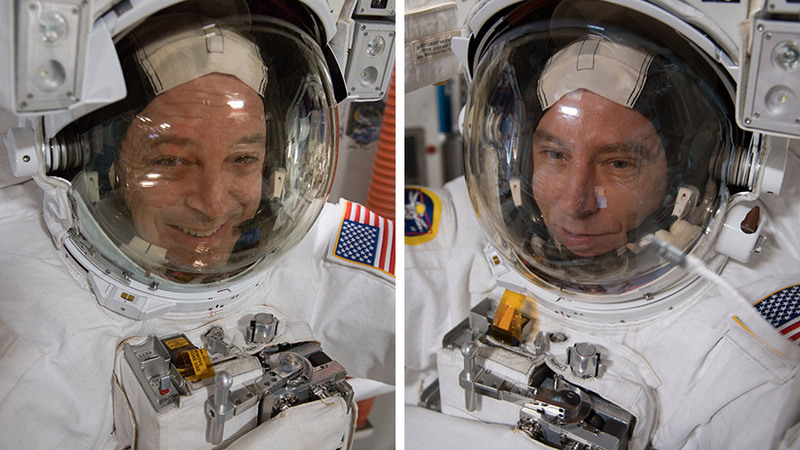 During the spacewalk, Arnold will wear a suit bearing red stripes while Feustel’s suit will not have stripes. 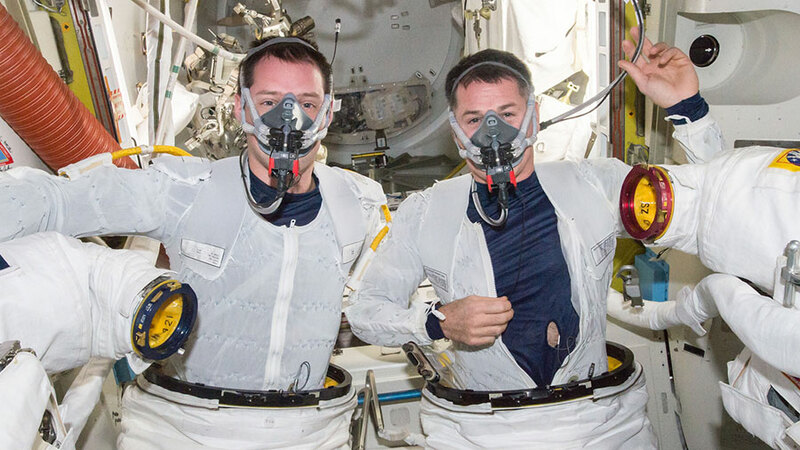 NASA astronauts Ricky Arnold and Drew Feustel are suited up inside U.S. spacesuits for a fit check verification ahead of a spacewalk that took place May 16, 2016. Correction, June 14, 2018: This post has been updated to clarify the timing of the first uncrewed test missions, which are planned for later this year. NASA astronauts Ricky Arnold and Drew Feustel are set to go on their third spacewalk together this year on Thursday at the International Space Station. Their new Expedition 56 crewmates Serena Auñón-Chancellor and Alexander Gerst are training today to support the two spacewalkers. 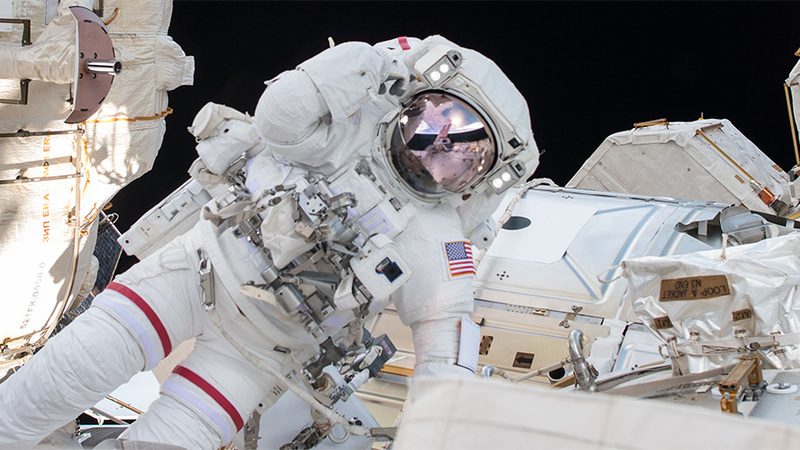 Arnold and Feustel will begin Thursday’s spacewalk at 8:10 a.m. to install new high definition cameras to support upcoming commercial crew missions from SpaceX and Boeing to the orbital laboratory. The first uncrewed test missions are planned to begin later this year. The cameras will provide improved views of the commercial crew vehicles as they approach and dock to the station. NASA TV will provide complete live coverage of the 211th space station spacewalk starting at 6:30 a.m.
Auñón-Chancellor and Gerst, who just arrived at the station on Friday, will assist the spacewalkers on Thursday. Gerst will help the spacewalkers in and out of their spacesuits. Auñón-Chancellor will operate the Canadarm2 robotic arm. The duo practiced today on a computer the robotics procedures necessary to maneuver a spacewalker to and from the worksite on the starboard side of the station’s truss structure. Arnold and Feustel had some extra time today to work on science and maintenance activities. Arnold worked with the Microgravity Science Glovebox to troubleshoot a semiconductor crystal growth experiment. Feustel performed some plumbing work in the Tranquility module before relocating a pair of incubator units to support new experiments being delivered on the next SpaceX Dragon cargo mission. Finally, the duo readied the Quest airlock and their spacesuits for Thursday morning’s spacewalk. The Pressurized Mating Adapter-3 is in the grip of the Canadarm2 robotic arm during its relocation and attachment to the Harmony module on March 26,2017. The crew researched the effects of living in space and set up a specialized microscope for a physics experiment today. Two astronauts are also getting ready for a Thursday spacewalk to continue setting up the International Space Station for commercial crew vehicles. Flight Engineers Peggy Whitson and Thomas Pesquet used a tape measure this morning and measured their arms, legs, hips, waist and chest. Researchers are studying how microgravity impacts body size and shape and are comparing crew measurements before, during and after a space mission. Whitson later began setting up gear for the ACE-T-1 (Advanced Colloids Experiment Temperature Control-1) physics study. She opened up the Fluids Integrated Rack and reconfigured the Light Microscopy Module to research tiny suspended particles designed by scientists and observe how they form organized structures within water. Commander Shane Kimbrough is getting ready for another spacewalk on Thursday at 8 a.m. EDT. This time he’ll go outside with Whitson to finish cable connections at the Harmony module where the Pressurized Mating Adapter-3 (PMA-3) was robotically attached on Sunday. The PMA-3 relocation gets the adapter ready for the new International Docking Adapter-3 set to be delivered on a future cargo mission. Astronaut Shane Kimbrough takes an out-of-this-world selfie during a spacewalk on March 24, 2017. The Pressurized Mating Adapter-3 (PMA-3) was robotically removed Sunday from the Tranquility module and attached to the Harmony module after being prepared during a successful spacewalk Friday. A second spacewalk is scheduled for Thursday at 8 a.m. EDT to finalize the PMA-3 cable connections on Harmony. Download hi-res video of briefing animations depicting the activities of all three spacewalks. 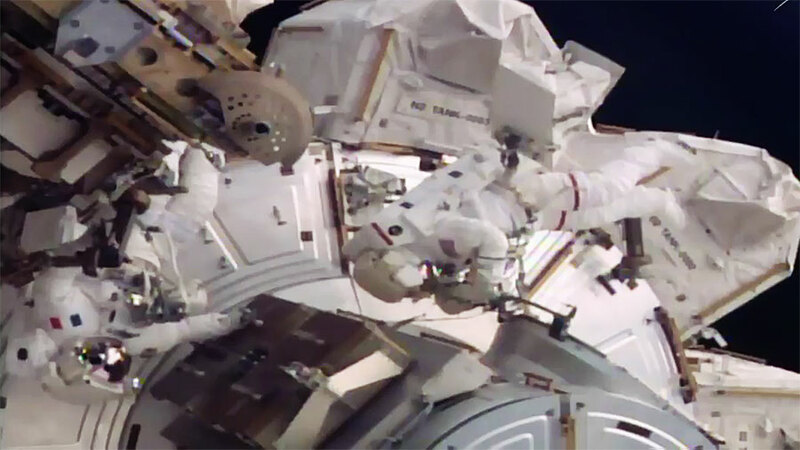 Commander Shane Kimbrough disconnected cables from PMA-3 while still attached to Tranquility during a spacewalk on Friday. That work allowed ground controllers to use the Canadarm2 robotic arm to remotely grapple and remove PMA-3 from Tranquility and attach it to Harmony. The relocation readies the PMA-3 for the future installation of the new International Docking Adapter-3 (IDA-3) set to be delivered on a future cargo mission. The IDA-3 will accommodate commercial crew vehicle dockings and provide the pressurized interface between the station and the adapter. Thursday’s spacewalk will see Kimbrough and Peggy Whitson complete the PMA-3 attachment work on the Harmony’s space-facing port. The duo will also install computer relay boxes containing software upgrades to enable future commercial crew vehicle dockings at the International Space Station. Expedition 50 Commander Shane Kimbrough of NASA and Flight Engineer Thomas Pesquet of ESA (European Space Agency concluded their spacewalk at 1:58 p.m. EDT. During the spacewalk, which lasted just over six-and-a-half hours, the two astronauts successfully disconnected cables and electrical connections on the Pressurized Mating Adapter-3 to prepare for its robotic move Sunday, March 26. The PMA-3 provides the pressurized interface between the station modules and the International Docking Adapter, which will accommodate commercial crew vehicle dockings. The astronauts also lubricated the latching end effector on the Special Purpose Dexterous Manipulator “extension” for the Canadarm2 robotic arm, inspected a radiator valve and replaced cameras on the Japanese segment of the outpost. A second spacewalk has been rescheduled to Thursday, March 30, and a third spacewalk now is targeted for Thursday, April 6. 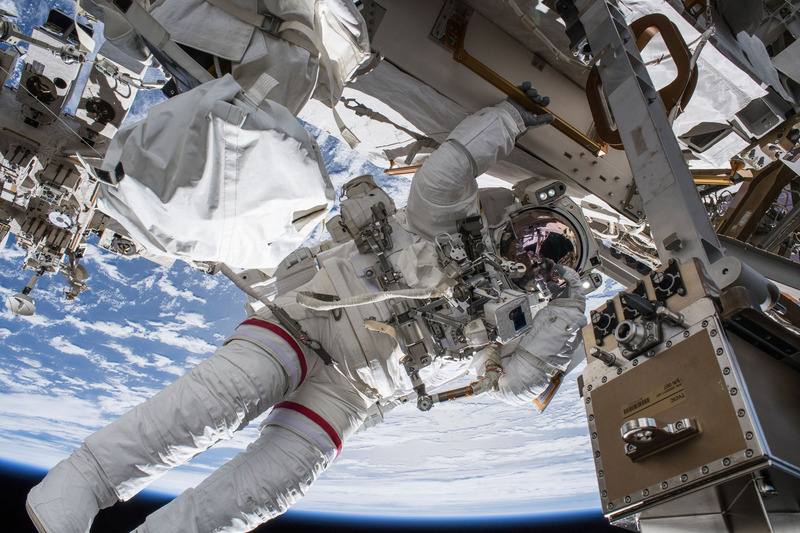 The second spacewalk will feature Kimbrough and Flight Engineer Peggy Whitson of NASA reconnecting cables and electrical connections on PMA-3 at its new home on top Harmony. They also will install the second of the two upgraded computer relay boxes on the station’s truss and install shields and covers on PMA-3 and the now-vacant common berthing mechanism port on Tranquility. The plan for the final spacewalk is for Whitson and Pesquet to replace an avionics box on the starboard truss called an ExPRESS Logistics Carrier, a storage platform. The box houses electrical and command and data routing equipment for the science experiments and replacement hardware stored outside of the station. The new avionics box is scheduled to launch on the upcoming Orbital ATK Cygnus cargo spacecraft mission. Spacewalkers have now spent a total of 1,236 hours and 38 minutes working outside the station during 198 spacewalks in support of assembly and maintenance of the orbiting laboratory. Astronauts Thomas Pesquet and Shane Kimbrough are seen during a pre-breathe exercise before starting a spacewalk on Jan. 13, 2017. Expedition 50 Commander Shane Kimbrough of NASA and Flight Engineer Thomas Pesquet of ESA (European Space Agency) will venture outside the International Space Station for a six-and-a-half hour spacewalk Friday, March 24. The spacewalk will begin at 8 a.m. EDT, with complete coverage on NASA TV and the agency’s website starting at 6:30 a.m. The two astronauts will prepare the Pressurized Mating Adapter-3 (PMA-3) for installation of the second International Docking Adapter, which will accommodate commercial crew vehicle dockings. Kimbrough and Pesquet will disconnect cables and electrical connections on PMA-3 to prepare for its robotic move Sunday, March 26. The PMA-3 provides the pressurized interface between the station modules and the docking adapter. PMA-3 will be moved from the port side of the Tranquility module to the space-facing side of the Harmony module, where it will become home for the docking adapter, which will be delivered on a future flight of a SpaceX Dragon cargo spacecraft. The spacewalkers also will install on the starboard zero truss a new computer relay box equipped with advanced software for the adapter. The two astronauts will lubricate the latching end effector on the Special Purpose Dexterous Manipulator “extension” for the Canadarm2 robotic arm, inspect a radiator valve suspected of a small ammonia leak and replace cameras on the Japanese segment of the outpost. Radiators are used to shed excess heat that builds up through normal space station operation. This will be the 198th spacewalk in support of space station assembly and maintenance. Kimbrough, who will embark on the fifth spacewalk of his career, will be wearing helmet camera #18. This will be the second spacewalk of Pesquet’s career, and he will be wearing helmet camera #20. Follow @space_station on Twitter for updates. For more information about the International Space Station, visit www.nasa.gov/station.